Capoeira is a Brazilian martial art rich in culture, which combines kicks and acrobatic movements to music and song to form a playful fight/game. Developed by slaves in Brazil, it is now present on every continent on the globe! 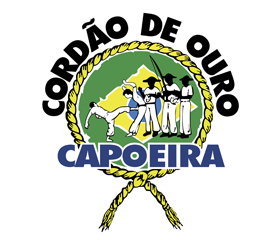 Group 'Cordao De Ouro' is the largest Capoeira group in the UK and one of the largest groups in the World. Learning Capoeira will bring you into full contact with an assortment of martial arts techniques, elements of dance, acrobatics and most importantly music— making Capoeira a truly unique martial art. Capoeira is for everyone—whether you want to keep fit, improve your flexibility, for self-defence, or simply to enjoy the Brazilian way of life! Capoeira continues to change as it spreads all across the globe. Different groups hold different philosophies and Capoeira is facing many changes in its impact with non-Brazilian cultures. However, its status as a global phenomena is mostly down to its addictive nature as a unique way of interacting with other people in a positive and enjoyable environment. 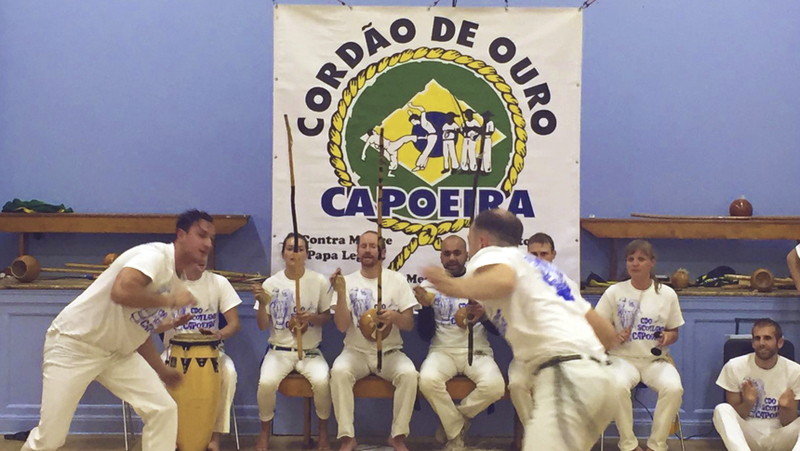 "Grupo Cordao de Ouro Capoeira is quickly recognised by its distinct mix of expression, improvisation and agility. Through specific training methods, students of Cordao de Ouro can discover ways of moving that they perhaps did not think could be possible. " Check out the video of Professor Medusa and Mestre Papa Leguas. 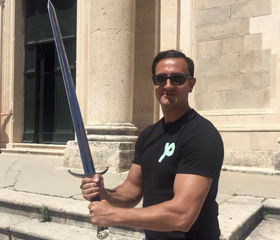 There are several sites in the Old City where Game of Thrones was filmed which includes the Pile and Ploče gate, the St. Dominika street, along the city walls includes the Bokar fort and the Minčeta tower. Visitors can take a walk along the city walls that surrounds the Old City. 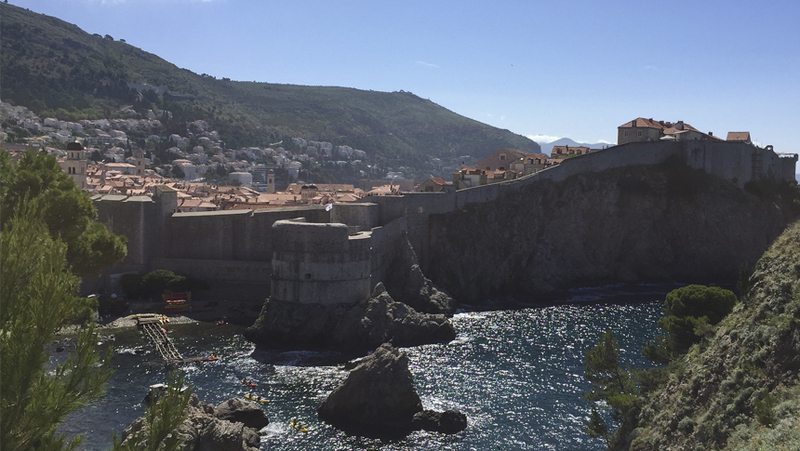 The walk takes a couple of hours and offers stunning views of the Dalmatian Coast and a bird’s eye view of the city. Fort Lovrijenac is one of the sights that can be seen from the wall, it is an impressive structure built on an outcropping rock. It is located just outside the Western wall of the Old Town and was featured in Game of Thrones. It was a great experience and I would recommend it to everyone! 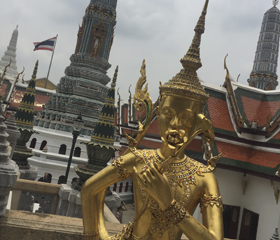 Muay Thai and Yoga. However the highlight was meeting Boon Mei the Elephant at the wildlife friend foundation park in Phetchaburi. 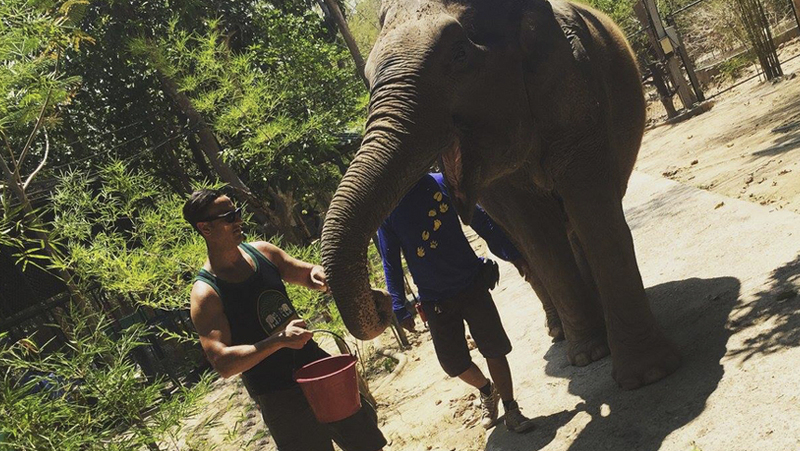 The WFFT rescues and helps wildlife and elephants in need, supports conservation efforts of wildlife in Asia. Their aim is to rescue, rehabilitate and care for wildlife that has been exploited by people or otherwise come into human conflict. Raise awareness and concern for wildlife and its habitat in Thailand and Southeast Asia. "Non-profit organisation in Phet Buri, Phetchaburi, Thailand"
Jaz created the banner and email campaign for White Stuff's exhibition display and then represented ESMS as school competition Judge. Jaz's brief was to create the brand and look and feel for the exhibition. Iain Mackay and his team from White Stuff had come up with the idea of using wire bikes and leaves as part of the display and Jaz worked on this idea to create an eye-catching visual look and feel for the exhibition and designed a logo, invitations, posters and a mission statement banner. Jaz created a fallen leaf effect vector background for his designs with a stamp effect logo. The bike was the focal point on the design but Jaz placed the picnic behind them to give the design more depth. He also used reds and browns as it's a colour associated with that time of year. "I was privileged to work with Iain Mackay and Stephanie Webb from White Stuff again, with the graphic design and also judging the School competition." Jaz and his client contact at ESMS, Kelly Robertson, were conscious that they didn't want to produce too much waste in the marketing materials. Therefore the main exhibition invitation was an email. A short run of leaflets and posters were created but all were done on recycled stock. 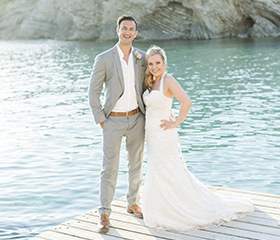 Jaz tied the knot with his beautiful wife Kelly at Elixir Shore Club, situated on the quiet sandy beach of Cala Codolar on the stunning west coast of Ibiza, overlooking the sea, sunset and Es Vedra. 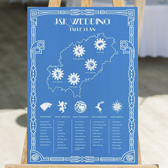 The wedding design for table plans and website was based on Art Deco styles, Balearic colours and Game of thrones themes. It worked in conjunction with the social media campaign. 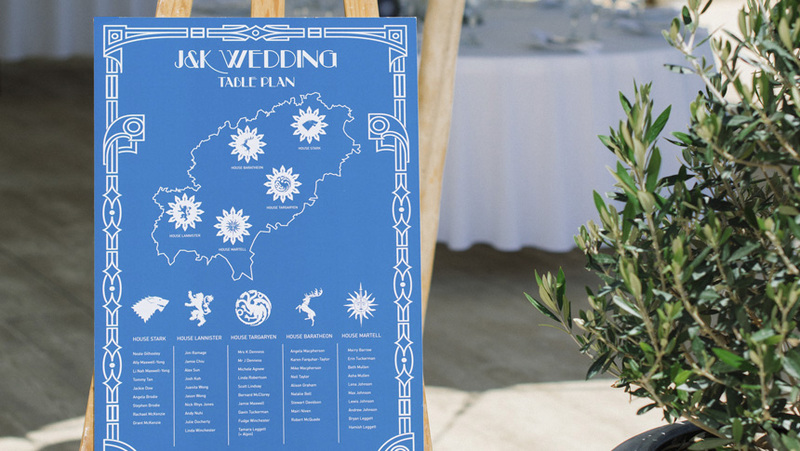 "A combination of styles and themes within a two colour print"
The result was fantastic and fitted in in well with the surrounding and venue in Ibiza. 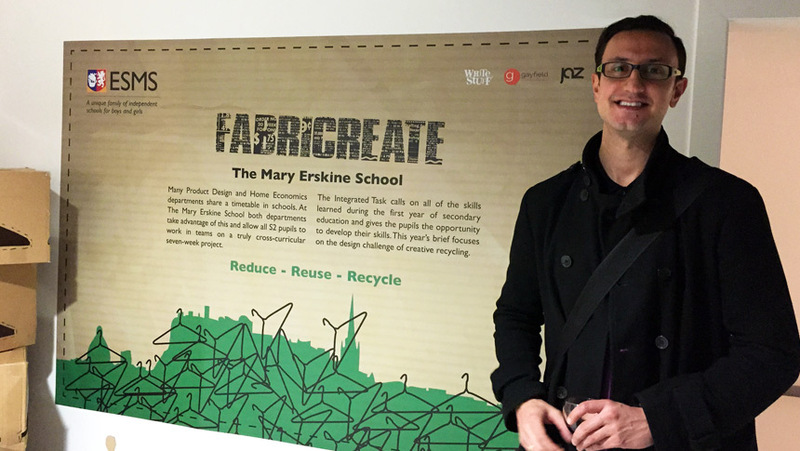 Jaz Denness designed the Fabricreate brand and marketing materials and was one of the judges for The Mary Erskine School S2 Integrated Task Exhibition at Gayfield Creative Spaces. Jaz's design reflected and focused on the central hanger installation from the exhibition which created the over-all theme for the event. Jaz was privileged to work with Dr John Ennis, Gayfield Creative Spaces, Iain Mackay and Stephanie Webb from White Stuff, and Valerie Henderson. The girls created excellent work on the brief of creative recycling. 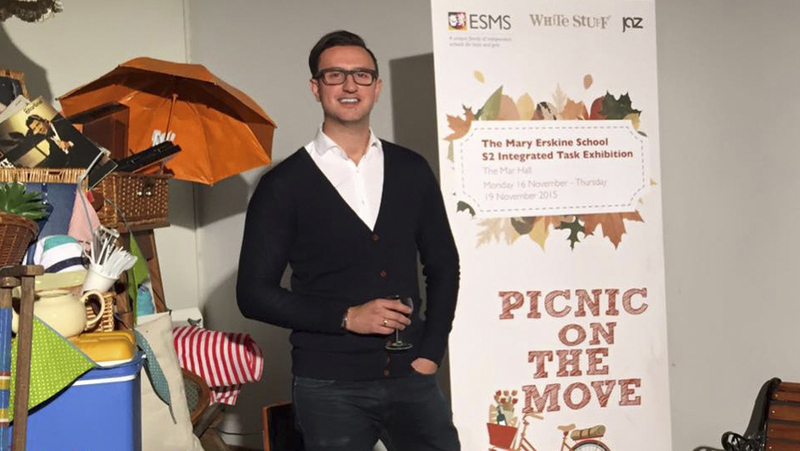 Graphic Designer and Judge for The Mary Erskine School Exhibition on Creative Recycling. Jaz's brief was to create the brand and look and feel for the exhibition. Iain Mackay and his team from White Stuff had come up with the idea of using wire coat hangers as part of the display and Jaz worked on this idea to create an eye-catching visual look and feel for the exhibition and designed a logo, invitations, posters and a mission statement vinyl. To tie in with the recycled theme, Jaz created a cardboard effect vector background for his designs with a stamp effect logo. The wire hangers were the focal point on the design but Jaz placed the Edinburgh skyline behind them to give the design more depth. He also used green as it's a colour associated with recycling and the environment. 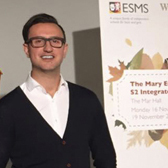 Since the exhibition theme was recycling, Jaz and his client contact at ESMS, Kelly Robertson, were conscious that they didn't want to produce too much waste in the marketing materials. Therefore the main exhibition invitation was an email. A short run of leaflets and posters were created but all were done on recycled stock. "I was thrilled to work with White Stuff's Iain Mackay & Stephanie Webb as well as Dr. John Ennis and Valerie Henderson from Gayfield Creative Spaces." 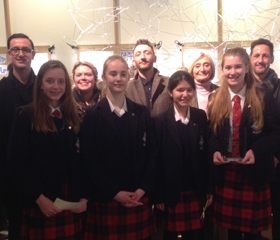 The private view and presentation evening was held on the 17th November 2014 where the overall winners of the exhibition were decided by Jaz Denness as well as Iain Mackay and Stephanie Webb from White Stuff, Dr. John Ennis from Gayfield Creative Spaces and Valerie Henderson. Fantastic private view of Fabricreate at Gayfield Creative Spaces. Well done Jaz Denness on some awesome design! On Monday 12th May, Sir Richard Branson visited Erskine Stewart's Melville Schools to talk to the children about entrepreneurship, the Young Enterprise Fiver Challenge, and giving back to the community. Signage designed by Jaz Denness which was printed via Mcrobb Display on 3mm foamex board. 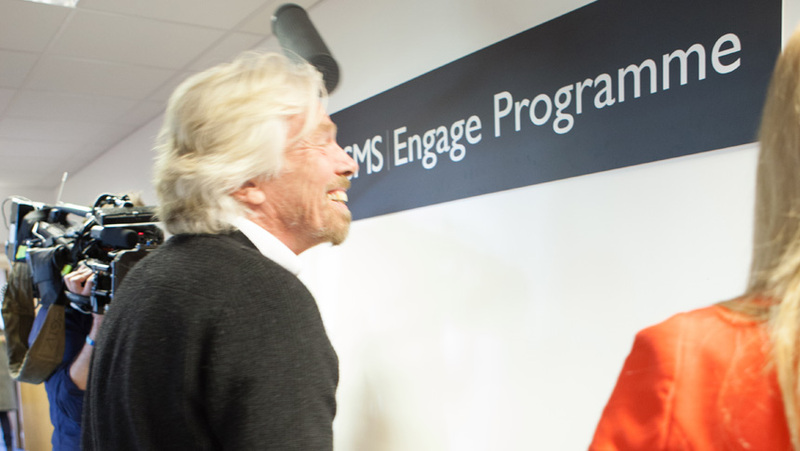 Sir Richard Branson visited the school to talk to the children about entrepreneurship. Whatever and wherever the tasting or event, the main focus is to give members an informal, enjoyable and relaxed night out. 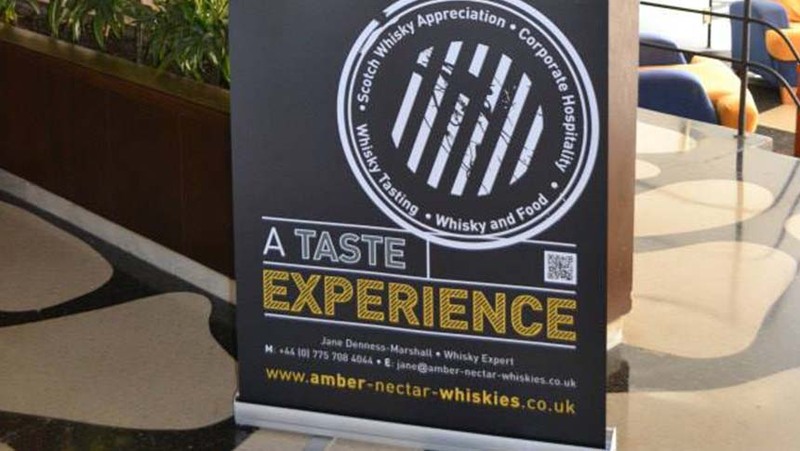 Events range from step by step instruction in how to get the most from tasting single cask, single malt whisky to more adventurous couplings of whisky with food and song. Wherever you live in the UK you can get together, relax and indulge with the Society's finest Homecoming Scotland 2014: Clans & Drams Whisky Month. Homecoming Scotland 2014: Clans & Drams Whisky Galore Month. 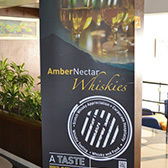 Amber Nectar Whiskies is run by Jane Denness-Marshall (Scotch Whisky Experience) the company has launched its new Brand to Scotland and Spain introducing some of the best ranges of Scottish Whisky. Another whisky extravaganza you won’t want to miss is the Scotch Malt Whisky Society, which celebrates the very best single malts produced in the country – all single-cask whiskies, from 126 different distilleries. You’ll have to be a member (or find one quickly and be very nice to them – they can sign in up to three guests each) in order to enjoy a dram at the Society’s convivial Members’ Rooms in Leith and Queen Street. The Dining Room restaurant in the latter is open to non-members. You don’t have to be a member to walk into a shop and buy as much of the amber nectar as you like, of course, and you can pick up the big brands from any supermarket. But for a more thoughtful and extensive range you’d do better to head to one of the speciality shops in the Old Town, such as Royal Mile Whiskies or Cadenhead’s Whisky Shop. At Royal Mile Whiskies, which has been specialising in single malts since 1991, the staff have the enviable task of sampling the produce in order to give customers the benefit of their knowledge. You won’t find a more enthusiastic, cheery bunch of sales assistants anywhere in the capital. "Run by Jane Denness-Marshall the company has launched its new Brand to Scotland and Spain introducing some of the best ranges of Scottish Whisky. Jaz designed the logo flyers, banners and website." A short stagger down the Royal Mile finds WM Cadenhead, Scotland’s oldest independent bottler, established in 1842. Selling a range of whisky from different distillers, each from individually selected casks, they guarantee never to chill-filter, add colouring agents or chemically alter the products they bottle. 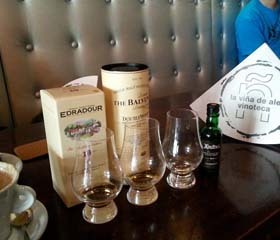 Best to double check, we think – they run whisky tastings in a local pub, enabling customers to sample the Cadenhead range and other interesting bottlings. Oh, and that cute Greyfriars Bobby lookalike sitting in the window? No, it’s not the drink affecting your vision: he does move occasionally. 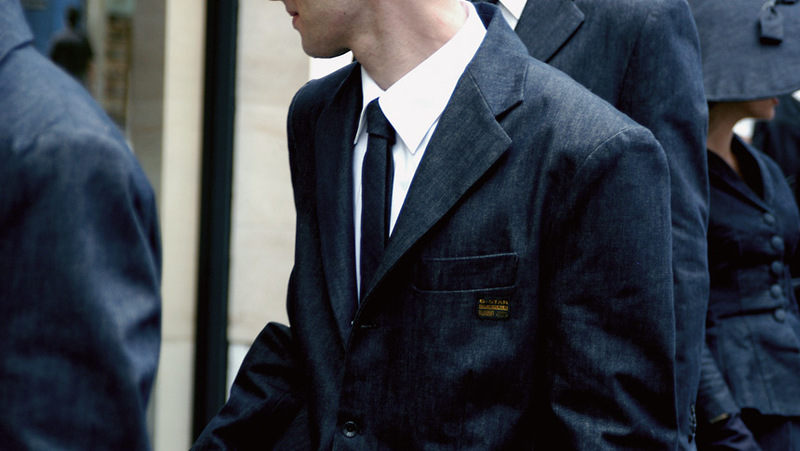 Like the whisky, he’s the real deal. Delighted with your work Jaz...thanks again! The Nescafé Plan is a global initiative that brings together, under one umbrella, the commitments of Nescafé which support responsible farming, production and consumption. To us, it’s more than just providing quality, great tasting coffee in a cup. Demonstrating the commitment to Responsible Farming, since 2011, provided over 15.5 million high-yield coffee trees to Colombian farmers, along with training, equipment and support. Grown from seed in local nurseries, these trees are naturally resistant to the leaf rust disease that has been affecting coffee farms in Colombia with devastating consequences. Now, 3 years after the first coffee trees were provided, they're marking a key milestone: the first harvest from the trees planted in 2011. To celebrate, we’re introducing Nescafé Gold Blend First Harvest – a Limited Edition pack that contains coffee from the farms that received those first trees. Nestlé is the world's leading nutrition, health and wellness company. 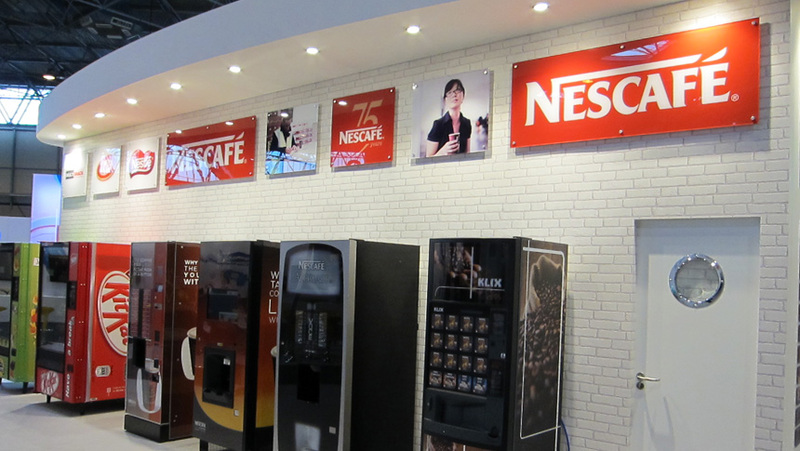 Nestle Professional were looking for a solution to showcase many of their brands on the same exhibition space. Nescafé Gold Blend First Harvest is the result of the work with Colombian coffee farmers to improve their lives and help them grow great quality coffee. Together with the Colombian Coffee Growers Federation (FNC), Nescafé've provided more than 15 million high-yield coffee trees to Colombian farms free of charge and with no obligation for the farmers to sell their coffee back to Nescafé. Nescafé've also provided training, equipment and support to help farmers produce a great tasting crop. Watch the video to the right to discover the story behind Nescafé Gold Blend First Harvest. Nestlé are committed to preserving natural restheces and eliminating food waste at every level of the operations. In the UK, the goal is to achieve zero waste to landfill from each of the factories by 2015. 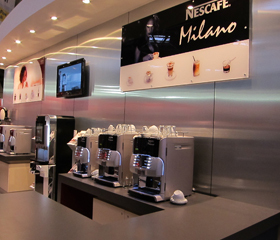 In 2012, Nescafé have reached a major milestone. All 3 of the UK coffee factories that produce Nescafé products (at Dalston, Hayes and Tutbury) have been verified by Bureau Veritas as sending zero production waste to landfill. Large format graphics on acrylic panels designed by Jaz and printed at Service Graphics. "Large format graphics on acrylic panels designed by Jaz and printed at Service Graphics." Filmhouse Cinema and Drambuie today announced a brand new partnership that will see the Scottish drinks brand support a series of film seasons that will bring "A Taste of the Extraordinary" to Edinburgh cinema audiences during the next twelve months. Taste of the Extraordinary to Edinburgh cinema audiences during the next twelve months. This innovative sponsorship, between the Scotch whisky spirit and Edinburgh's home of cultural cinema, will kick-off with a season of seven of the nine surviving silent films by Alfred Hitchcock. These films, recently restored by the BFI, will be brought to Scottish audiences for the first time accompanied by live soundtrack performances. The hidden Hitchcock gems will be shown at Filmhouse during November, with further "A Taste of the Extraordinary" cinema seasons to follow in the coming months. Rod White, Head of Filmhouse said, "For decades now Filmhouse has showcased the very best cinema from around the world, including new releases, archive titles, seasons and festivals. Our collaboration with Drambuie is a first of its kind partnership for Filmhouse and over the next year we look forward to working with them on bringing "A Taste of the Extraordinary" to our audiences, starting in November with the Hitchcock Silent Films." For almost 35 years Filmhouse has been Edinburgh's foremost independent cinema, celebrating world cinema in all its brilliance and diversity. Filmhouse is a trading name of Centre for the Moving Image, a company limited by guarantee and a registered charity. 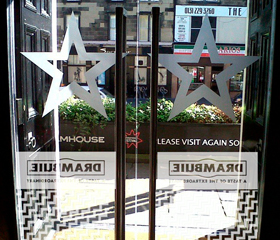 "Jaz Denness Designed the brand across the glass doors as frosted vinyl and a range of print above the door and interior walls." 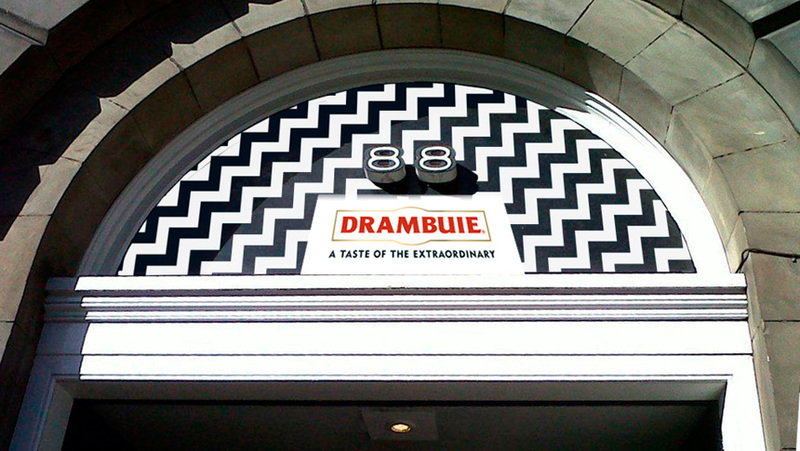 Vicki Wonders, Senior Brand Manager at The Drambuie Liqueur Company Ltd, said: "This is an exciting and relevant collaboration for Drambuie. As an internationally recognised, family-owned brand with its roots still firmly in Scotland, it gives us the opportunity to bring a series of 'firsts' to our consumers in Edinburgh. By adding a series of unique screenings to the already outstanding offering that the Filmhouse curates, we are enriching the cultural experience of the audience. By offering them the opportunity to reacquaint themselves with the brand itself with complimentary cocktails being served throughout the season we really are offering 'A Taste of the Extraordinary'to Edinburgh. Jaz Denness Designed the brand across the glass doors as frosted vinyl and a range of print above the door and interior walls. 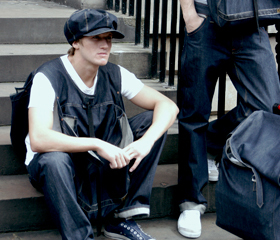 In 2005 a new G-STAR opened its first Scottish store in Edinburgh and commisioned Klaklak to design the launch. Jaz took photo's intended for POS's, adverts and email campaigns to advertise the new shop. Using a Canon G5 with micro and zoom lenses, Jaz shot a range of shots of location and detail close ups focusing on the brand logo on fabric. Click to see images.  "Jaz shot a range of shots of location and detail close ups focusing on the brand logo on fabric."